In the late nineteenth century, a group of gringo treasure hunters popped south of the border hoping to find some fabled Aztec gold. Instead, they left emptyhanded, only leaving about two dozen or so disintered Aztec burial grounds in their greedy wake. One of those tombs was that of the emperor. Shortly thereafter, his sworn protector, Huitzilo felt himself dragged back to the mortal coil only to walk the Earth again, seeking to punish the defilers, even if it takes eternity. The weapons might be different these days, but brutality never changes. Sorry it’s not colored & like the others I did. I’m opting to spend the time catching up. If I’ve the extra time, I’ll go back & add them. 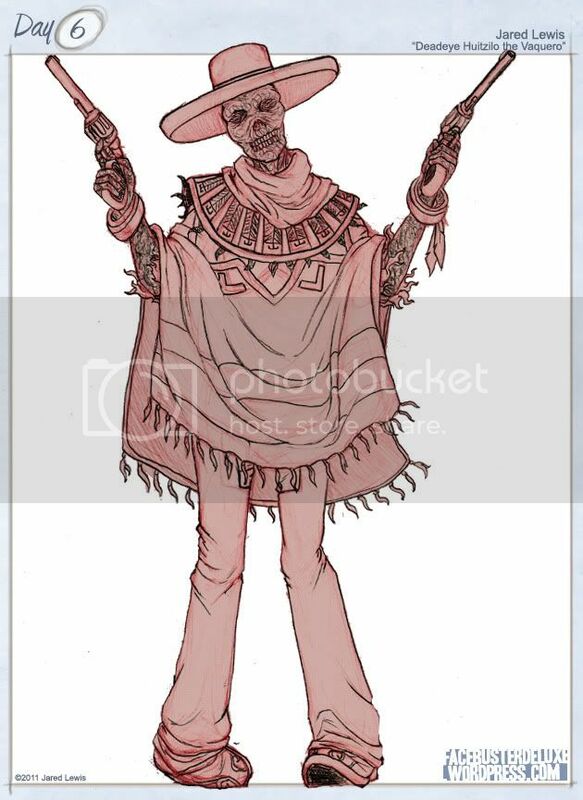 On the list of jumping off points I had for characters “cowboy mummy” was a joke but was something I kept going back to trying to rationalize. It suddenly clicked when I figured there was a better chance of an Aztec mummy than your garden variety Egyptian bandaged number wandering the old west; so I went that route. His name is based on Huitzilopochtli, who wikipedia tells me was the Aztec god of war. The word has something to do with hummingbirds, which I thought would also have a cool connotation as to how quick a shot he is, despite rigor & the frailty of a corpse. Zombie gunman! I love his feet. It really adds to an uncoordinated feel. Gunslinging Aztec mummy? Hell yes!